Does your child have a milk allergy? soy allergy? peanut allergy? and you want to teach them how to read labels? The food allergy parking lot is a fun way to teach your child how to read their food allergy which can be very useful when they need to read labels. I created this parking lot using a leftover piece of cardboard, markers, and a ruler. 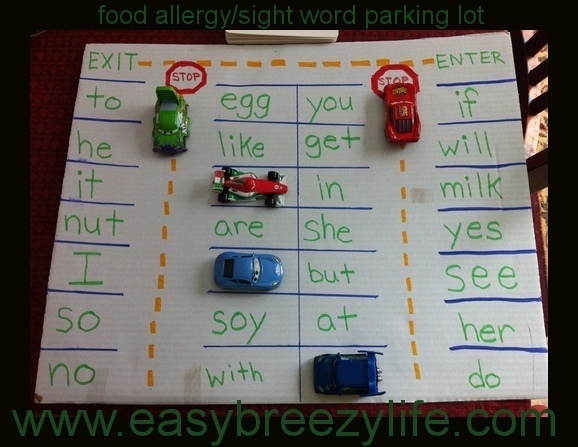 Simply write out the sight words and food allergy words in the parking spaces with marker. Using flash cards read the sight word out loud and ask your child to drive their car through the parking lot and park their car on the word. For a more advanced game, say the word out loud without using the flashcards. Content on this site is copyright and protected. Email easybreezyfoodallergies@gmail.com to request permission to share material. I'm so glad you like it. Check back soon as I'll be adding more great idea's to educate your little one about their allergies. Cute! Can't wait to see more and share them with others! GREAT concept of creating a game. You are so darn clever. These types of ideas are needed and appreciated. I don’t know how you got this idea. This so smart and I'm so sure kids will enjoy this while they are learning. Thumbs up !